Faridabad, one of the oldest cities of the Haryana state is situated in the Faridabad district. The city is named after its founder, Shaikh Farid, the treasurer of Jahangir. It is also the largest city in the Delhi Metropolitan Area. Faridabad has become a major industrial hub of Haryana, over the years and has grown enormously during the last couple of decades, because a large number of industries that have been growing in number and immense development that has occurred the city. Faridabad has been shortlisted as one of the hundred cities by Ministry of Urban Development (MoUD) to participate in the Smart City Challenge. 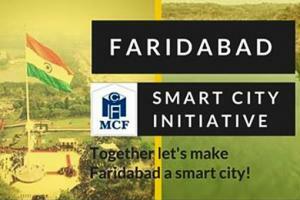 Under which, Municipal Corporation of Faridabad (MCF) is required to prepare a Smart City Proposal (SCP) to compete for its position among first top twenty smart cities in India and formulate its own vision, sub-goals and strategies through active consultation of its citizens and all stakeholders. Citizens are requested to actively participate in the discussions and contribute towards making Faridabad a smart city. Kindly post your views till 30th November, 2015. 2. Robust Solid waste management system should be put in place. 5. Empowerment and responsibility on municipality to stop illegal construction , maintenance of parks, cleanliness of roads etc.